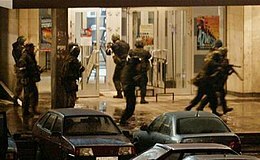 The Moscow theater hostage crisis (also known as the 2002 Nord-Ost siege) was the seizure of a crowded Dubrovka Theater by 40 to 50 armed Chechens on 23 October 2002 that involved 850 hostages and ended with the death of at least 170 people. The attackers, led by Movsar Barayev, claimed allegiance to the Islamist separatist movement in Chechnya. They demanded the withdrawal of Russian forces from Chechnya and an end to the Second Chechen War. Russian special forces storm the Dubrovka Theater during the 2002 Moscow hostage crisis. Due to the layout of the theater, special forces would have had to fight through 30 metres (100 ft) of corridor and attack up a well-defended staircase before they could reach the hall in which the hostages were held. The attackers had numerous explosives, with the most powerful in the center of the auditorium. After the murder of two female hostages two-and-a-half days in, Spetsnaz operators from Federal Security Service (FSB) Alpha and Vega Groups, supported by a Russian Ministry of Internal Affairs (MVD) SOBR unit, pumped an undisclosed chemical agent into the building's ventilation system and began the rescue operation. All 40 of the insurgents were killed, and up to 204 hostages died during the siege, including nine foreigners, due to poisoning by the gas. All but two of the hostages who died during the siege were killed by the toxic substance pumped into the theater to subdue the insurgents. The identity of the gas was never disclosed, although it is believed by some to have been a fentanyl derivative, such as carfentanil. The hostages were seized on 23 October at the House of Culture of State Ball-Bearing Plant Number 1 in the Dubrovka area of Moscow about four kilometers south-east of the Moscow Kremlin. During Act II of a sold-out performance of Nord-Ost a little after 9:00 PM, 40–50 heavily armed and masked men and women drove in a bus to the theater and entered the main hall firing assault rifles in the air. The black and camouflage clad Chechens took approximately 850–900 people hostage, including members of the audience and performers, among them an MVD general. The reaction of spectators inside the theater to the news that the theater was under terrorist attack was not uniform: some people remained calm, some reacted hysterically, and others fainted. Some performers who had been resting backstage escaped through an open window and called the police; in all, some 90 people managed to flee the building or hide. The militant leader told the hostages that the attackers (who identified themselves as a suicide squad from "the 29th Division") had no grudge against foreign nationals (about 75 in number from 14 countries, including Australia, Germany, the Netherlands, Ukraine, the United Kingdom and the United States) and promised to release anyone who showed a foreign passport. Every nation has the right to their fate. Russia has taken away this right from the Chechens and today we want to reclaim these rights, which Allah has given us, in the same way he has given it to other nations. Allah has given us the right of freedom and the right to choose our destiny. And the Russian occupiers have flooded our land with our children's blood. And we have longed for a just solution. People are unaware of the innocent who are dying in Chechnya: the sheikhs, the women, the children and the weak ones. And therefore, we have chosen this approach. This approach is for the freedom of the Chechen people and there is no difference in where we die, and therefore we have decided to die here, in Moscow. And we will take with us the lives of hundreds of sinners. If we die, others will come and follow us—our brothers and sisters who are willing to sacrifice their lives, in Allah's way, to liberate their nation. Our nationalists have died but people have said that they, the nationalists, are terrorists and criminals. But the truth is Russia is the true criminal. According to the Kremlin's aide Sergei Yastrzhembsky, "When they were told that the withdrawal of troops was unrealistic within the short period, that it was a very long process, the terrorists put forward the demand to withdraw Russian troops from anywhere in the Republic of Chechnya without specifying which area it was." The hostage-takers demanded termination of the use of artillery and air forces in Chechnya starting the next day (Russian forces ceased using heavy weapons until 28 September), a halt to the notorious zachistka ("mopping-up") operations, and that President of Russia Vladimir Putin should publicly declare that he was striving to stop the war in Chechnya. By the time of the hostage-taking, the conflict in the embattled republic was killing an average of three federal troops daily. Cell phone conversations between the hostages trapped in the building and their family members revealed that the hostage-takers had grenades, mines and improvised explosive devices strapped to their bodies, and had deployed more explosives throughout the theater. The militants used Arabic names among themselves, and the female terrorists wore Arab-style niqab clothes which are highly unusual in the North Caucasus region. Mufti Akhmad-Khadzhi Shamayev, official leader of Chechnya's Muslims, said he had no information about who the attackers were and condemned attacks on civilians. The pro-Moscow Islamic leader of Chechnya also condemned the attack. All hostages were kept in the auditorium and the orchestra pit was used as a lavatory. The situation in the hall was nervous and it frequently changed depending on the mood of the hostage-takers, who were following reports in the mass media. Any kind of misinformation caused hopelessness among the hostages and new aggression among their captors, who would threaten to shoot hostages and blow up the building, but no major disasters took place during the siege. The gunmen let members of the audience make phone calls. One hostage used her mobile phone to plead with authorities not to storm the auditorium, as truckloads of police and soldiers with armored vehicles surrounded the building. The attackers released 150 to 200 people, including children, pregnant women, Muslims, some foreign-born theater-goers and people requiring health treatment in the early hours after they invaded. Two women managed to escape (one of them was injured while escaping). The terrorists said they were ready to kill 10 hostages for any of their number killed if the security forces intervened. At 1:30 AM, Olga Romanova, a 26 year old civilian acting on her own, entered the theater, crossing the police cordon by herself. She entered the theater and began urging the hostages to stand up to their captors. There was considerable confusion in the auditorium. The terrorists believed she was a Federal Security Service (FSB) agent and she was shot and killed several seconds later. Romanova's body was later removed from the building by a Russian medical team, incorrectly reported by the Moscow police as the body of the first hostage who was killed while trying to escape. Romanova was described as 'strong-willed', and lived near the theater. It is unknown how she crossed the police lines undetected. The hostage-takers demanded to talk with Joseph Kobzon, a parliament member and singer, and with International Red Cross representatives. Four people, including a man waving some white fabric like a flag, entered the building about 1:20 PM. Shortly thereafter, a man in his 60s, appearing feeble and distraught, left the theatre. The Interfax news agency identified him as a British citizen, but did not provide details. A woman and three children, believed to be Russians, were let out a few minutes later. Other well-known public and political figures such as Aslambek Aslakhanov, Irina Khakamada, Ruslan Khasbulatov, Boris Nemtsov and Grigory Yavlinsky took part in negotiations with the hostage-takers. Ex-President of the Soviet Union Mikhail Gorbachev also announced his willingness to act as an intermediary in the course of negotiations. Militants also demanded that representatives of the International Red Cross and Médecins Sans Frontières come to the theater to lead negotiations. FSB Colonel Konstantin Vasilyev attempted to enter the patio of the theater, but was shot at while approaching the building and forced to retreat. According to the FSB, 39 hostages were set free by the terrorists on 24 October 2002, but they repeated via one of the hostages an earlier threat to start shooting their captives if Russia failed to take their demands seriously. Negotiations on the release of non-Russian nationals were conducted by various embassies and the Chechens promised to release all foreign hostages. The kidnappers claimed they were ready to release 50 Russian hostages if Akhmad Kadyrov, head of Chechnya's pro-Moscow administration, would come to the theater, but Kadyrov did not respond, and the release did not take place. A hot water pipe had burst overnight and was flooding the ground floor. The hostage-takers called the flooding a "provocation" and no agreement had been reached on having the pipe repaired, the FSB spokesman said. It later turned out that the sewer system was used by the Russian special forces for listening purposes. During the next day, the following people took part in negotiations with the militants: journalists Anna Politkovskaya, Sergei Govorukhin and Mark Franchetti and public figures Yevgeny Primakov, Ruslan Aushev and again Aslambek Aslakhanov. The terrorists demanded negotiation with an official representative of Vladimir Putin. Relatives of the hostages staged anti-war demonstrations outside the theater and in central Moscow. The guerrillas agreed to release 75 foreign citizens in the presence of diplomatic representatives of their states. 15 Russian citizens were released, including eight children (aged 7 to 13). After a meeting with Putin, the FSB head Nikolai Patrushev offered to spare the lives of the Chechens if they released the remaining hostages unharmed. A group of Russian doctors including Dr. Leonid Roshal, head of the Medical Center for Catastrophes, entered the theater to bring medicine for the hostages and said the terrorists were not beating or threatening their captives. He said most of the hostages were calm and that only "two or three" of the hostages were hysterical. Some hot food, warm clothes, and medicine had also been taken in by the Red Cross. We have nothing to lose. We have already covered 2,000 kilometres by coming here. There is no way back... We have come to die. Our motto is freedom and paradise. We already have freedom as we've come to Moscow. Now we want to be in paradise. He also said the group had come to Moscow not to kill the hostages or to fight with Russia's elite troops, as they had had enough fighting in Chechnya over the years: "We came here with a specific aim — to put an end to the war and that is it." At 9:55 PM, four hostages (citizens of Azerbaijan) were released, bringing the total number of hostages that were set free on this day to 19. After dusk, a man identified as Gennady Vlakh ran across the square and gained entry to the theater. He said that his son was among the hostages, but his son did not seem to be present and the man was led away and shot by the Chechens. There is considerable confusion surrounding this incident, and Vlakh's body was cremated before it was identified. Around midnight, a gunfire incident took place as Denis Gribkov, a 30-year-old male hostage, ran over the backs of theater seats toward the female insurgents who were sitting next to a large improvised explosive device. A male Chechen shot at him and missed, but stray bullets hit and severely wounded Tamara Starkova and fatally wounded Pavel Zakharov, who were evacuated from the building soon after. Gribkov was removed from the auditorium and later found dead from gunshot wounds. President Vladimir Putin visiting the Sklifosovsky Emergency Medicine Institute to meet with hostages rescued from the theater in Dubrovka. During the night, Akhmed Zakayev, a Chechen envoy and associate of the separatist President Aslan Maskhadov, appealed to the extremists and asked them to "refrain from rash steps". The Chechens told the BBC that a special representative of President Putin planned to come to the theater for talks the next day. Two members of the Spetznaz Alpha Group moving around in the no-man's land were seriously wounded by a grenade fired from the building by the terrorists, which was blamed by the Moscow police chief Vladimir Pronin on the media news leak. According to an officer in the Russian special forces cited by The Guardian, the leak was controlled: "We leaked the information that the storming would take place at three in the morning. The Chechen fighters were on their guard. They began shooting, but there was no raid. Then there was the natural reaction — a relaxation. And at 5 a.m. we stormed the place." Early Saturday morning, 26 October, forces from Russia's Spetsnaz (Special Forces, literally "special purpose") from the FSB (Alpha Group and Vympel), with the assistance of the Russian Ministry of Internal Affairs (MVD) SOBR unit, surrounded and stormed the theater; all were heavily armed and masked. Deputy Interior Minister Vladimir Vasilyev stated that the raid was prompted by a panic among the captives due to the execution of two female hostages. The raid was planned shortly after the hostages were initially seized and the shooting cited as a proximate cause had occurred about three hours before the operation began. When the shooting began, the terrorists told their hostages to lean forward in the theater seats and cover their heads behind the seats. Hostages reported that some people in the audience fell asleep, and some of the gunmen put on respirators. As the terrorists and hostages alike began to fall unconscious, several of the female terrorists made a dash for the balcony but passed out before they reached the stairs. They were later found shot dead. Two of the Alpha Group were also overcome by the gas. According to the Russian government, fighting between the troops and the still-conscious Chechen fighters continued in other parts of the building for another 30 minutes to one hour. Initial reports stated that three terrorists were captured alive (the BBC reported that a "handful of surviving fighters were led away in handcuffs") and two of them managed to escape. Later, the government claimed that all hostage-takers had been killed in the storming. Alpha team troops said that "this is our first successful operation for years". Moskovskij Komsomolets cited a Russian special forces operative saying that "if it were a usual storming, we'd have had 150 casualties among our men, added to the hostages." The validity of these claims has never been verified. At 7:00 a.m., rescuers began carrying the bodies of hostages out of the building. Bodies were laid in rows on the foyer and the pavement at the main entrance to the TC, unprotected from falling rain and snow. None of the bodies witnessed by The Guardian correspondent Nick Paton Walsh had bullet wounds or showed signs of bleeding, but "their faces were waxy, white and drawn, their eyes open and blank." Shortly, the entire space was filled with bodies of the dead and those unconscious from the gas but still alive. Ambulances were standing by and ordinary city buses were brought in. Medical workers were expecting to treat victims of explosions and gunfire but not a secret chemical agent. Were the drug used indeed a fentanyl derivative or other μ⁠-⁠opioid receptor agonist, an opioid receptor antagonist drug like naloxone would have counteracted the chemical agent's effects, but would have had to have been administered by rescue workers immediately upon arriving. Some reports said the drug was used to save some hostages. The bodies of dead hostages were put in two buses which were parked at the TC. Initial reports said nothing about casualties among the hostages. The crisis HQ representatives went to the college hall, where relatives of the hostages had been waiting, and told them that allegedly there were no fatalities among the hostages. The first official report of fatalities among the hostages came at about 9:00 a.m. (despite the death of five children which had been already reported by medical personnel, the official statement claimed there were no children among the dead). At 1:00 p.m., Vasilyev announced at a press conference a "definitive" death toll of 67 hostages, who he said were killed by Chechens, but again said no children nor foreigners were among those killed. Armed guards were posted at the hospitals where victims were taken and doctors were ordered not to release any of the theater patients in case militants had concealed themselves among the hostages. The hostages' family members panicked as the government refused to release any information about which hospitals their loved ones had been taken to, or even whether their relatives were among the dead. The official number of the dead rose to 90, including 25 children, while it was still claimed that the final attack was provoked by the terrorists executing their captives. Later the same day, the official death toll among hostages had risen to at least 118 and the officials had not specified exactly what killed them. By 28 October, of the 646 former hostages who remained hospitalized, 150 were still in intensive care and 45 were in critical condition. Seventy-three hostages (including six minors) were rendered no medical aid. There were several Chechens among the hostages and it may be that some of them were not treated because of their Chechen names. Money and other valuables belonging to the victims vanished; official reports stated that the valuables were stolen by an FSB officer who was later killed in a car crash. [dubious – discuss][better source needed] The Russian authorities initially maintained that none of the deaths among the hostages occurred through poisoning. They spoke of health problems that were exacerbated by the three-day ordeal with very little food or water, or indeed, medical attention. The number of estimated casualties varies significantly because many hostages remained unaccounted and were not included in the official list (see below). Some estimates[who?] have put the civilian death toll at more than 200 with 204 names on one list., or even 300, including people who died during a year after the siege from consequences of the poison gas. Some former hostages and relatives of the victims claim that the death toll from the chemical agent is being kept secret. According to official numbers, 40 terrorists and about 130 hostages died during the raid or in the following days. Doctor Andrei Seltsovsky, Moscow's health committee chairman, announced that all but one of the hostages killed in the raid had died of the effects of the unknown gas rather than from gunshot wounds. The cause of death listed for all hostages was declared to be "terrorism", claiming they died from heart attacks or other physical ailments. Among the fatalities, 17 were Nord-Ost cast members, including two child actors. Of the foreign nationals, three were from Ukraine, and the others were citizens of Austria, Armenia, Belarus, Kazakhstan, the Netherlands and the United States. About 700 surviving hostages were poisoned by gas, and some of them received injuries leading to disabilities of the second and third class (by the Russian/ex-Soviet disability classification system; indicate medium- and maximum-severity and debilitation). Several Russian special forces operatives were also poisoned by the gas during the operation. According to court testimony from Prof. A. Vorobiev, Director of the Russian Academic Bacteriology Center, most, if not all, of the deaths were caused by suffocation when hostages collapsed on chairs with heads falling back or were transported and left lying on their backs by rescue workers; in such a position, tongue prolapse causes blockage of breathing. The Chechen radical militant group the Special Purpose Islamic Regiment (SPIR) conducted the operation. The group was led by Movsar Barayev. Military commander Shamil Basayev posted a statement on his website claiming ultimate responsibility for the incident, resigning all official positions within the Chechen government and promising new attacks. He also apologized to Chechnya's elected president and separatist leader Aslan Maskhadov for not informing him of the planned raid and asked him for forgiveness. Basayev defended the hostage-taking for giving "all Russians a first-hand insight into all the charms of the war unleashed by Russia and take it back to where it originated from" and said that his next "main goal will be destroying the enemy and exacting maximum damage" and "the next time, those who come won't make any demands, won't take hostages." A series of suicide bombings aimed at civilian targets in Russia followed in 2003 and 2004. The Russian government claimed that wiretapped phone conversations prove that Maskhadov knew of the plans in advance, which he denied. Aslan Maskhadov and his representatives in the West condemned the attack which they said had nothing to do with official policy. Maskhadov said he felt responsible for those "who resorted to self-sacrifice in despair", but also said the "barbaric and inhumane policies" of the Russian leadership were ultimately to blame and criticized the storming of the theater. He offered to start unconditional peace talks with the Russian government to find a political solution to the conflict in Chechnya. The siege was seen as a public relations disaster for Maskhadov, and his more radical Islamic field commanders correspondingly benefited.[why?] Some commentators suggested that Movladi Udugov was in charge from behind the scenes. Russian military expert Pavel Felgenhauer suggested that the aim of the extremist leaders seemed to have been to provoke the Russian government forces "to kill ethnic Russians in Moscow on a large scale", which happened. According to the report by Russian investigators, Zura Barayeva, the widow of Arbi Barayev, led the female members of the group, while a man known as Yasir, identified by his documents as Idris Alkhazurov, was said to be the group's "ideologist" believed to be trained in Saudi Arabia. Russian officials said Chechen militants received financing from groups based in Turkey and that they intercepted telephone calls from the captors to unidentified embassies in Moscow, as well as to Turkey and the United Arab Emirates. After the raid, Moscow Mayor Yuri Luzhkov said that "the operation was carried out brilliantly by special forces"; he claimed he had wanted a negotiated end to the crisis, but the final attack was made necessary by the reported killing of hostages. The Russian presidential special envoy for human rights in Chechnya, Abdul-Khakim Sultygov, said the bloody outcome was "a good lesson to the terrorists and their accomplices." Deputy Interior Minister Vasilyev launched a Moscow-wide operation to catch anyone who may have helped the militants, while his boss, Interior Minister Boris Gryzlov, urged people to be vigilant and to report anyone acting suspiciously to police. On 29 October, Vasilyev said he only had the authority to state that special chemical agents had been used and that some 30 suspected militants and their collaborators, including several civil servants and security officers, had been arrested around the theater and in other parts of the city in what Gryzlov called an "unprecedented operation" to identify what he described as a vast terrorist network in Moscow and the surrounding region. Russian President Vladimir Putin defended the scale and violence of the assault in a televised address later on the morning of 26 October, stating that the government had "achieved the near impossible, saving hundreds... of people" and that the rescue "proved it is impossible to bring Russia to its knees". Putin thanked the special forces as well as the Russian citizens for their "bravery" and the international community for the support given against the "common enemy". He also asked forgiveness for not being able to save more of the hostages, and declared Monday a national day of mourning for those who died. He vowed to continue fighting "international terrorism". On 29 October, Putin released another televised statement, saying: "Russia will respond with measures that are adequate to the threat to the Russian Federation, striking all the places where the terrorists themselves, the organizers of these crimes and their ideological and financial inspirations are. I stress, wherever they may be located." It was commonly assumed Putin was threatening the former Soviet Republic of Georgia. Putin's comments came as British Prime Minister Tony Blair phoned him to congratulate him on the ending of the siege. The attacks prompted Putin's government to tighten Russia's grip on Chechnya. On 28 October, two days after the crisis, he announced that unspecified "measures adequate to the threat" would henceforth be taken in response to terrorist activity, with reports of 30 fighters killed near the Chechen capital Grozny. The Russian Ministry of Defense canceled plans to reduce the 80,000 troop presence in the tiny breakaway republic. In early November, Defense Minister Sergei Ivanov announced Russian troops had launched large-scale operations against separatists throughout Chechnya. The actions of the military caused a new wave of refugees, according to the pro-Moscow Chechen official and the hostage crisis negotiator Aslanbek Aslakhanov. On 29 May 2008, the European Court of Human Rights (ECHR) unanimously condemned Russia for enforced disappearances in five cases from Chechnya, including the disappearance of two young women in Ulus-Kert (the prosecutor's office initially stated to media that Aminat Dugayeva and Kurbika Zinabdiyeva had been arrested on suspicion of involvement with the Moscow siege). President Maskhadov's unconditional offer for peace talks with Russia was dismissed, and Russian Foreign Minister Sergei Lavrov compared such calls with the suggestion that Europe should conduct such talks with the former al-Qaeda leader Osama bin Laden. Russia also accused Akhmed Zakayev of involvement in the attack. When he visited Denmark for a peace congress in October 2002 (the World Chechen Congress event in Copenhagen), the Russians demanded his arrest and extradition; Zakayev was held for over a month, but was released after Danish authorities stated they were not convinced that sufficient evidence had been provided. The Kremlin also accused the Danish authorities of "solidarity with terrorists" by allowing the meeting of about 100 Chechens, Russian human rights activists and lawmakers from Russia and other European countries to gather and discuss ways to end the fighting. In early November, the Russian Duma approved a broad array of anti-terrorism legislation ranging from far-reaching restrictions on media coverage of terrorism-related incidents to secret burials for killed terrorists (one lawmaker proposed wrapping terrorists' corpses in pigskin and another suggested "carting them around the city with their legs dangling"). The new media law severely restricted the media's reporting of anti-terrorist operations, banning publication or broadcast of "any statement that hinders an operation to break such a siege, or attempts to justify the aims of the hostage-takers". These new policies prompted renewed fears in Russia that Putin was systematically taking control of all Russian media. Sergei Yushenkov, whose Liberal Russia party voted against the change, was quoted by Reuters as saying: "On a wave of emotion, we have in fact legitimised censorship and practically banned criticism of the authorities in emergency situations." Coverage of Chechnya had already been severely restricted, needing the cooperation of both the Russian military and the Moscow-backed Chechen administration (see Russian government censorship of Chechnya coverage). A law by which corpses of people convicted or accused of terrorism would not be released to their families, but disposed of in secret was approved, applying to the bodies of the militants killed in the Moscow crisis, and later applying even to President Maskhadov, who was killed in 2005. In 2003, Human Rights Watch reported Chechens in Moscow were subjected to increased police harassment after the hostage crisis. Moscow's Chechens rose in numbers from about 20,000 in the Soviet period to an estimated 80,000 in 2002. Many in the Russian press and in the international media warned that the death of so many hostages in the special forces' rescue operation would severely damage President Putin's popularity. This prediction turned out to be wrong. Shortly after the siege, the Russian president had record public approval ratings; in December 2002, 83% of Russians reportedly declared themselves satisfied with Putin's rule and his handling of the siege. The official investigation that the Moscow City Prosecutor's Office had been carrying out for three and a half years failed to provide positive information on the gas agent that killed hostages, possible antidote to that agent, the number of hostages released by the operation, the number of militants who had seized the theater (hostages claimed that they saw more than 50 militants, whereas only 40 hostage takers were in the building according to the official version), and the names of officials who had made the decision about the assault. On 1 June 2007, news came that the official investigation had been suspended. The reason provided was that the "culprit had not been located". The same month, Tatiana Karpova, co-chair of the Nord-Ost Organization of former hostages and families of the dead, demanded a new criminal investigation. She claimed the authorities failed to meet their obligations related to right to life. She stated her concern about the lack of medical care for the injured, and future medical problems for the survivors. In July 2007, relatives of those who died in the hostage-taking urged the Office of the Prosecutor General of Russia to investigate whether senior officials were responsible for the deaths. The Duma refused to consider a proposal by the liberal democratic Union of Rightist Forces party to form an investigative commission charged with probing the government's actions in the theater siege. An independent investigation of the event was undertaken by Russian politicians Sergei Yushenkov, Sergei Kovalev, journalist Anna Politkovskaya, Hoover Institute scholar John B. Dunlop, and former FSB officers Aleksander Litvinenko and Mikhail Trepashkin. According to their version, FSB knew about the terrorist group's arrival in Moscow and directed them to the theater through their agent provocateur Khanpasha Terkibayev ("Abu Bakar"), whose name was in the list of hostage takers and who left the theater alive. In April 2003 Litvinenko gave information about Terkibayev ("the Terkibayev file") to Sergei Yushenkov when he visited London. Yushenkov passed this file to Politkovskaya and she was able to interview Terkibayev in person. A few days later, Yushenkov was assassinated by gunfire in Moscow. Terkibayev was later killed in an apparent car crash in Chechnya. In June 2003, Litvinenko stated in an interview with the Australian television programme Dateline, that two of the Chechen militants involved in the siege—whom he named "Abdul the Bloody" and "Abu Bakar"—were working for the FSB, and that the agency manipulated the terrorists into staging the attack. Litvinenko said: "[w]hen they tried to find [Abdul the Bloody and Abu Bakar] among the rotting corpses of dead terrorists, they weren't there. The FSB got its agents out. So the FSB agents among Chechens organized the whole thing on FSB orders, and those agents were released". "Abu Bakar" (presumably Terkibayev) was also described as an FSB agent and organizer of the theater siege by Anna Politkovskaya, Alexander Khinshtein and other journalists. It seems though that Litvinenko and Politkovskaya had been the victims of an elaborate and clever trap, laid by the former's former employer, the FSB. Sanobar Shermatova and a co-author had pointed out in "Moskovskie novosti" that Terkibaev, almost certainly linked to the FSB, had for a number of years been involved in "anti-Wahhabi" activities and would therefore not have been an acceptable participant to the "Abu Bakar" group, to say the least. John Dunlop identifies "Abu Bakar" as Ruslan Elmurzaev, claimed by Mikhail Trepaskin to have been a resident of Moscow, not Chechnya, and to have been involved in various criminal activities operating out of the Hotel Salyut in Moscow. There were reports that Elmurzaev had not been killed in the storming of the theatre. Film director Sergei Govorukhin, one of the volunteer negotiators at Dubrovka, has said that he is convinced that Elmurzaev, who he identified as an FSB agent, is still alive. Russian prosecutors were unable to show Elmurzaev's corpse and during a visit to Chechnya in October 2003, Russian intelligence officers confirmed to him that Elmurzaev was alive and well and living in Chechnya. The titular leader of the hostage takers was one Movsar Baraev, the nephew of the late and infamous "wahhabi" kidnapper Arbi Baraev, a figure reported to have shadowy connections to both the FSB and GRU. In January 2003, the French journalist Anne Nivat reported that Baraev had been arrested two months before the hostage-taking incident. This information being true, Baraev was already in Russian custody when the theatre siege occurred. Nivat also reported that two of the female hostage takers were also in Russian custody at the time of the siege while late Duma Deputy Yurii Shchekochikhin wrote that another female hostage taker was in custody at the time. That "Abu Bakar" was in control and not Baraev was supported by an article in "Moskovskie novosti" by journalists Shermatova and Teit, in which it was reported that a hushed conversation between Abu Bakar and Baraev had been accidentally captured by NTV. Baraev declared that the hostage takers had been sent by Shamil Basaev only to be quietly corrected by Abu Bakar to add 'Aslan Maskhadov', in order to link the latter to the hostage taking. There is also the figure of Arman Menkeev, a retired major in the GRU and a specialist in making explosive devices. He was arrested by the Interior Ministry in November 2002 at the Moscow Oblast base allegedly used by the terrorists but was released shortly afterwards. He may have subsequently been rearrested but was not charged with a crime and is apparently not in custody. FSB officers, who interrogated Menkeev in Lefortovo prison, classified him as "loyal to the Russian government", adding that "He knows how to keep a military and state secret". The plastic explosive used by the terrorists was in fact "imitation plastic explosives" which had a "Ministry of Defence origin". The Moscow City Prosecutor's Office claimed that Menkeev could have been the source of this material. Apart from two suicide belts, which were more of a danger to the wearers, the bombs placed in the theatre (and elsewhere in Moscow prior to the siege) lacked essential elements like batteries; this provided the required conditions for the successful storming of the theatre. What would have been the motive for possible Russian involvement? During the period preceding the hostage taking, heavy pressure was being brought to bear by the West and within Russia on Putin to negotiate with the Chechen moderates and their leader, Aslan Maskhadov. Public opinion polls in Russia showed that the conflict was eroding the popularity of the president. Promising peacemaking initiatives were also proceeding in the months preceding the theatre siege, some backed by the Council of Europe and the OSCE. Once the Russian special forces had re-taken the theatre, support for the war rose among the Russian public. As evidence against Maskhadov, Russians cited a tape first shown on Al Jazeera and subsequently on Russian television, although only a fragment of the original tape was shown on Russian TV. On the original full length tape it was evident that it had been made in late summer, not in October, and had concerned a military operation against federal forces, not an act of hostage taking. Nevertheless, Maskhadov had been discredited although there is no credible evidence to link him with the siege. In the end, it could be said that both the Russian government and the Chechen extremists had achieved their goals; talk of negotiations had ended and Maskhadov's reputation had been damaged. After the siege, 61 former hostages started seeking compensation for physical and emotional suffering totaling almost $60 million from Moscow city authorities (according to Russia's then-new anti-terrorism law, the region where an act of terror occurs should pay compensation for moral and material damages). Moscow Mayor Yuri Luzhkov's office denounced the suits, saying it could not be held responsible as "the Chechen issue and its consequences are not within the jurisdiction of the Moscow authorities in any way." The Moscow administration earlier agreed to pay 50,000 roubles ($1,570) in compensation to each former hostage and 100,000 roubles ($3,140) to relatives of those killed. In all but one of the cases, Moscow city courts rejected the compensation claims. In July 2003, 80 plaintiffs from Russia, Ukraine, the Netherlands, and Kazakhstan turned to the European Court for Human Rights, claiming that their right to life had been violated by Russian authorities' handling of the standoff. In April 2007, Igor Trunov, the claimants' advocate, reported that the ECHR had finally begun hearings into a complaint filed in 2003 by the victims against the Russian government. Trunov added that not only Russian citizens, but also those from Ukraine, the Netherlands, and Kazakhstan, filed complaints in the Strasbourg Court. The plaintiffs demand €50,000 each in compensation for the violation of their human rights. The case was accepted by the court in December 2007. On 8 July 2008, The Moscow Times reported that the hearings at the European Court of Human Rights will be closed to the public at the request of Russian authorities as, according to Igor Trunov, they "have promised full disclosure on how they handled the crisis", including "the makeup of the knockout gas used in the storming of the theater by commandos." On 20 December 2011, the European Court of Human Rights published its judgement in the case, ordering Russia to pay the 64 applicants a total of 1.3 million euros in compensation. The court also found that Russia had violated Article 2 of the European Convention on Human Rights when handling the hostage crisis, "with inadequate planning and conduct of the rescue operation", and with the "authorities' failure to conduct an effective investigation into the rescue operation", although the Court found that there had been "no violation of Article 2 of the Convention on account of the decision by the authorities to resolve the hostage crisis by force and to use the gas." It was reported that efforts to treat victims were complicated because the Russian government refused to inform doctors what type of gas had been used. In the records of the official investigation, the agent is referred to as a "gaseous substance". In other cases, it is referred to as an "unidentified chemical substance". Analysis of drug residue from the clothing of two British hostages and the urine of a third British hostage, by a team of researchers at the British chemical and biological defense laboratories at Porton Down, Wiltshire, England, indicated two fentanyl derivatives were used. Neither of those two were fentanyl or 3-methylfentanyl (the Russian Minister of Health earlier said fentanyl or one of its derivatives had been used, but did not accurately specify which derivatives). The Porton Down analysis by James R. Riches and his colleagues, Analysis of Clothing and Urine from Moscow Theatre Siege Casualties Reveals Carfentanil and Remifentanil Use, showed that while fentanyl or 3-methyl fentanyl were absent from the urine of one survivor and residues of the agent in the clothing of two other British survivors, the veterinary large animal sedative drug carfentanil and anesthetic agent remifentanil were identified by liquid chromatographic tandem mass spectrometry in one hostage's urine and on the clothing of three hostages who had returned to Britain after the hostage rescue. The authors concluded that carfentanil and remifentanil were used as a mixture in the chemical agent employed by Russian troops to subdue the Chechen terrorists and hostages at the Barricade Theater, perhaps suspended in the anesthetic agent halothane. United Nations – In unanimously adopting Resolution 1440 (2002), the United Nations Security Council condemned the "heinous" act and demanded the immediate and unconditional release of all hostages. The Council also demanded immediate and unconditional release of all hostages of that terrorist act and expressed the deepest sympathy and condolences to the people and the government of the Russian Federation and to the victims of the terrorist attack and their families. In addition, the Council urged all states to cooperate with the Russian Federation authorities in their efforts to find and bring to justice the perpetrators, organizers and sponsors of that terrorist attack. Iraq – In a statement read on Iraqi state television, Iraqi President Saddam Hussein said the hostage-taking would eventually benefit the United States and Israel in undermining Islam: "It's not wise for the Chechens to lose the sympathy of Russia and the Russian people. The tyrant of our era is Zionism and America, and not Russia, China or India." A documentary by the BBC's Horizon in 2004 investigated the gas that was pumped into the theater. In 2003, HBO broadcast Terror In Moscow, a documentary directed by Dan Reed. Interviews with hostages and footage taken inside and outside the theater during the crisis are shown in the documentary. In September 2006, In Your Hands, a play based on the events of the Moscow theater siege, written by Natalia Pelevine, opened in London at the New End Theatre. In April 2008 Pelevine said that Russian authorities had banned the play following its Russian debut in the city of Makhachkala, the capital of Dagestan near Chechnya. Another play, We Declare You a Terrorist by Tim J. Lord, about the incident premiered at the 2009 Summer Play Festival. Tom Clancy's Rainbow Six Siege, a 2015 counter-terrorism video game, used the Moscow theater hostage crisis, along with other historical hostage extraction operations, as inspiration for the game and as research for making the game more accurate. ^ a b c It Was a Long Time Ago, and It Never Happened Anyway: Russia and the Communist Past by David Satter, Yale University Press, 13 December 2011, ISBN 0300111452, page 303. ^ "Gas 'killed Moscow hostages'". 27 October 2002 – via news.bbc.co.uk. ^ a b MacKenzie, Debora (29 October 2002). "Mystery of Russian gas deepens". New Scientist. ^ a b "She Died Trying to Save the Hostages". Retrieved 28 January 2012. ^ "Chechen rebels release some hostages". smh.com.au. 24 October 2002. Retrieved 11 January 2016. ^ "Events, facts, conclusions". Retrieved 29 January 2012. ^ "Why did she shoot". Archived from the original on 12 July 2014. Retrieved 29 January 2012. ^ Traynor, Ian (27 October 2002). "Troops bring freedom and death to theatre of blood". The Guardian. Retrieved 23 February 2012. ^ "Russia names Moscow Siege Gas". BBC. 31 October 2002. ^ a b Walsh, Nick Paton (27 October 2002). "Siege rescue carnage as gas kills hostages". The Guardian. Retrieved 5 March 2018. ^ a b c The October 2002 Moscow Hostage-Taking Incident (Part 1) by John B. Dunlop, Radio Free Europe Reports, 18 December 2003. ^ "Переадресация..." feedbackgroup.narod.ru. Archived from the original on 27 November 2018. Retrieved 3 January 2019. ^ "The Riyadus-Salikhin Reconnaissance and Sabotage Battalion of Chechen Martyrs". cdi.org. Archived from the original on 9 May 2007. ^ Vladimir Kovalev, NTV RIP, Again. Transitions Online, 19 February 2003. ^ Альфред Кох: пост главы "Газпром-Медиа" заняла марионетка Кремля, Newsru.com, 17 January 2003. ^ Йордана сначала проверят, а потом отставят, Newsru.com, 20 January 2003. ^ Putin vows to crush terrorists, BBC News, 28 October 2002. ^ a b "Investigation of the case of hostage taking at the Theatre Center at Dubrovka in October 2002, was suspended". echo.msk.ru (in Russian). Echo of Moscow News Service. 1 June 2007. ^ The October 2002 Moscow Hostage-Taking Incident (Part 2) by John B. Dunlop, Radio Free Europe Reports, 8 January 2004. ^ The October 2002 Moscow Hostage-Taking Incident (Part 3) by John B. Dunlop, Radio Free Europe Reports, 15 January 2004. ^ Radio FreeLiberty The Moscow Hostage Crisis: one year later – by John Dunlop, Radio Free Europe Reports, 29 October 2003. ^ Lazaredes, Nick (4 June 2003). "Terrorism takes front stage — Russia's theatre siege". SBS. Archived from the original on 21 August 2006. Retrieved 28 November 2006. ^ "Human Rights Violations in Chechnya". hrvc.net. 5 February 2003. Archived from the original on 5 February 2003. ^ "Corruption Watch". RadioFreeEurope/RadioLiberty. 18 December 2003. ^ a b c "Corruption Watch". RadioFreeEurope/RadioLiberty. 8 January 2004. ^ a b c d e f "Russia Report: October 29, 2003". RadioFreeEurope/RadioLiberty. ^ "Corruption Watch". RadioFreeEurope/RadioLiberty. 15 January 2004. ^ "Lawsuits begin into deadly Moscow hostage-taking". CBC. ^ Weir, Fred (22 January 2003). "In Moscow, a test case for government accountability" – via Christian Science Monitor. ^ Russia asks European court to limit Moscow theater siege files, RIA Novosti 03/ 07/ 2008. ^ Dubrovka Proceedings Will Be Closed Archived 14 August 2008 at the Wayback Machine The Moscow Times 7 July 2008. ^ "Strasbourg court orders Russia to pay 1.3 MLN euros". RT. 20 December 2011. ^ "SECURITY COUNCIL CONDEMNS 'HEINOUS' MOSCOW HOSTAGE-TAKING, DEMANDS IMMEDIATE, UNCONDITIONAL RELEASE – Meetings Coverage and Press Releases". United Nations. ^ "Terror in Moscow: Transcript". On the Media. 24 October 2003. Archived from the original on 17 March 2013. Retrieved 30 December 2012. John B. Dunlop. The 2002 Dubrovka and 2004 Beslan Hostage Crises: A Critique of Russian Counter-Terrorism. ISBN 3-89821-608-X. Nord-Ost. Memorial Book of Lost Hostages. Above site in English, winner of 2007 'Golden Site' award.